Just a few miles from the Chattooga River, which defines the border between this part of upper South Carolia and Georgia, stands a humble church. The Oconee County community of Long Creek is home to the former congregation of the Cowboy Church, founded in July of 2010. The church originally belonged to the Beaverdam Baptist Association, which once supported the former Long Creek Academy. The Cowboy Church began with 35 members and grew to 75 over its first year. True to its name, the church marked its anniversary with a cowboy-themed celebration complete with trail rides, bluegrass music, and a barbecue. In fact, trail rides were a part of this non-traditional church from its inception. The “cowboy” approach to worship at this mountain church was designed to attract members who either did not have the time for a traditional service or simply desired a more casual approach to church. The congregation met the third Sunday of the month for a church supper at 5 PM followed by a worship service. While bluegrass was the church’s music of choice, members sang along with the traditional Broadman hymnal. 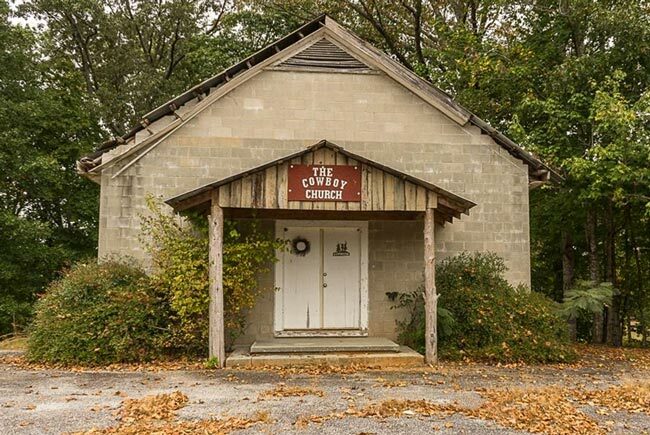 The Cowboy Church acquired the former Laurel Springs Methodist Church shortly after it was organized. The small sanctuary no longer appears to be open as the building currently has no electricity.